2016 Update - We apologize for not updating Stephanie's page; however, we do still carry her work and take special orders for similar pieces as shown below. If you want current photos email kmalone@dollery.com. 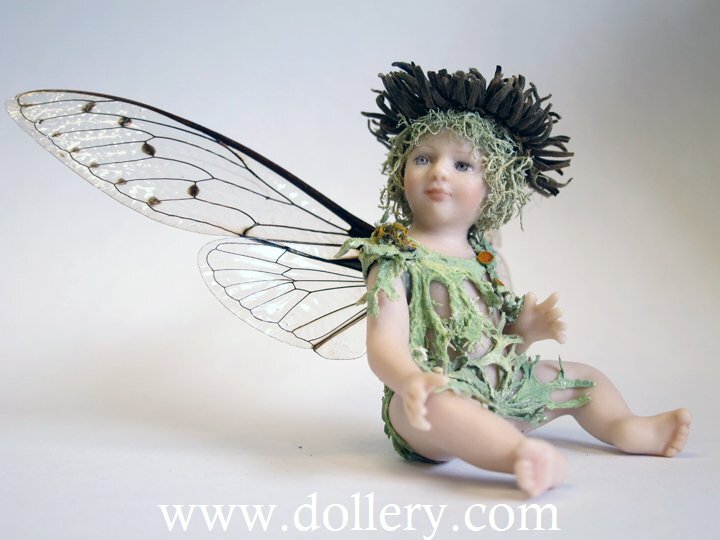 Stephanie is mainly focusing on her amazing one of a kind pieces however she does have new fairies. Feel free to email us to be added to our mailing list for her work. Below is just a sampling of her work. Take a peek! Email kmalone@dollery.com or call 781-447-6677. for further information. For further information on Stephanie's background directly from her click here! Many pictures of these dolls are samples only. Some of these pieces were sold thru other retailers or kept by Stephanie as samples). We will take orders against our orders for similar pieces. Below are also one of a kind pieces that are actually in stock as well as gift boxes and other pieces in her regular line. We will post more actual pieces as they come in. Email kmalone@dollery.com for actual information. Our copyright located on the picture is for the picture itself only. 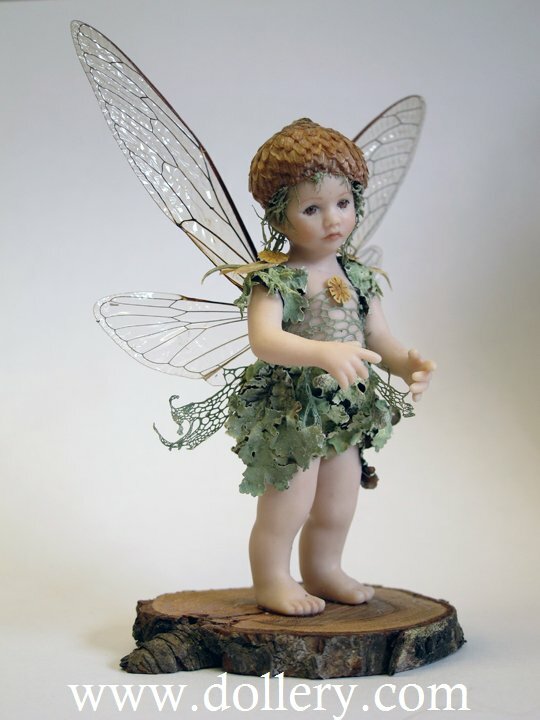 Stephanie has been creating wonderful fantasy dolls, including her "teacup" fairies since 1977. She attended all our doll shows from 1988-1998. She is an attribute to her profession. It is Stephanie's talent for sculpting & painting with attention to detail at such an intricate level that has made her such a success. She captures the collector's heart and makes you want to take home a little of the magic that turns fantasy into reality. Stephanie is featured here holding her one of a kind Princess and the Frog. New work created by Stephanie especially for the Dollery in recent years. Be sure to contact us for info on new custom orders you may like and get on our waitlist for her work - email kmalone@dollery.com. These are about 3" (7-8cm). Were $145 (may have increased). Still available to order. Porcelain - 15" - One of a kind - Click on photo to see a larger picture. Magnificent. All Swarovski crystals in rainbow. Porcelain - One in stock in blonde as shown. Also - one brunette. We will add the real cicada butterfly wings to it upon request. Adorable! Porcelain - One of a kind - Red head with blue perfume bottle. (Further information coming soon) One of a kind- one piece was broken so was unable to be purchased. May have others. Call. (Further information coming soon) One of a kind- may have been purchased by another retailer or kept by Stephanie. Similar sculpts may be able to be ordered. They are 5 3/8 inches by 7 1/2 inches. They are all wood shadowboxes that can hang on the wall or rest on a shelf in three different styles. Each on of a kind shadow box contains an original porcelain china painted figure. Quantities are limited. Moon Lady - Dressed in antique silk chiffon sitting on an iridescent paper mache moon. The sky, her crown and dress are sprinkled with an abundance of Swarovski Austrian crystals. we will work with you on delivery dates! Fairy - Surrounded by a garden of antique millinery flowers which radiate the light of dozens of Swarovski Austrian crystals. Her hair is raw silk and her crown is gold washed sterling silver. Her wings are cicada. Mermaid - Her fins and tail are hand dyed antique lace and her stuffed fabric tail is amde of antique metallic net accented with Swarovski Austrian crystals. 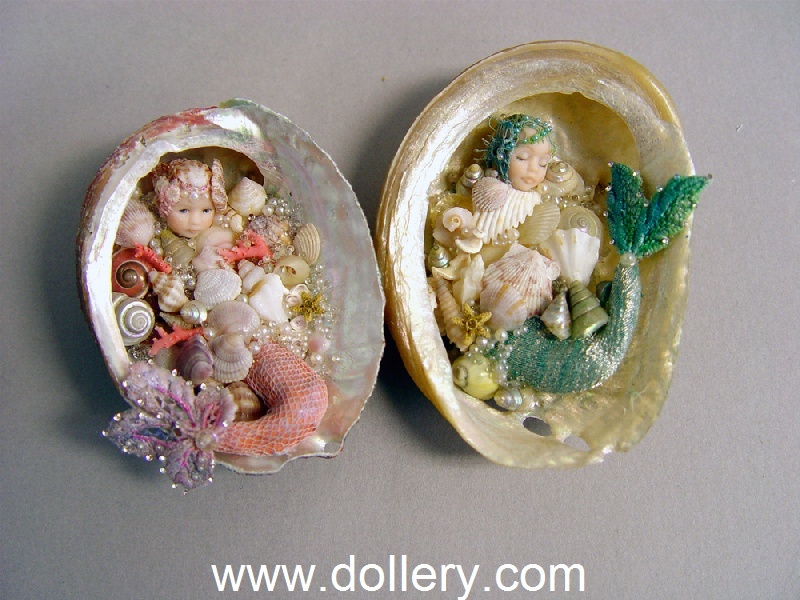 Her crown and backdrop are made up of miniscule natural seashells.